1. 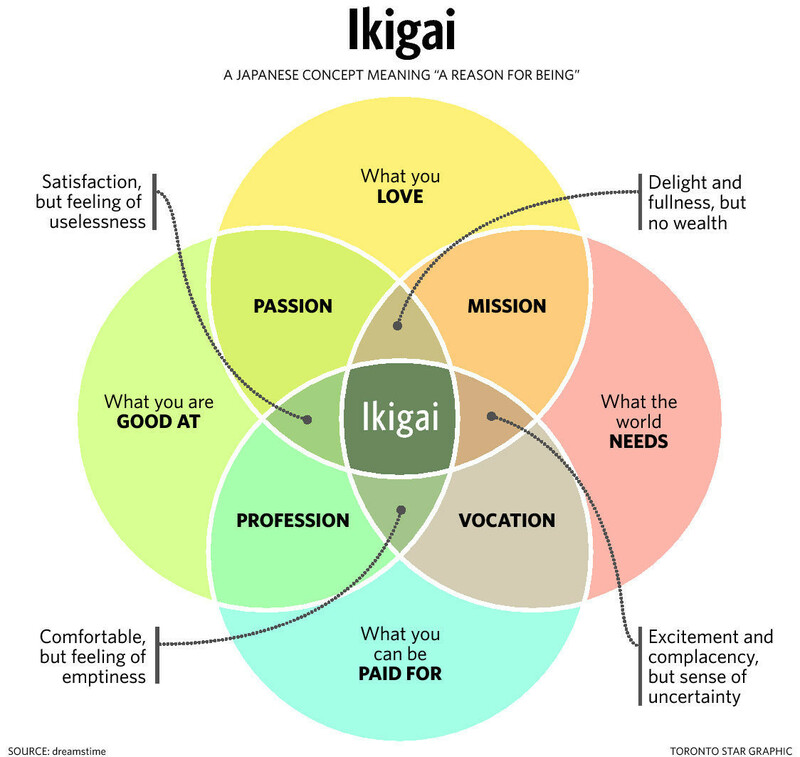 IS THIS JAPANESECONCEPT THE SECRET TO A LONG, HAPPY, MEANINGFUL LIFE? I don’t want to get too touchy feely on you, I promise. 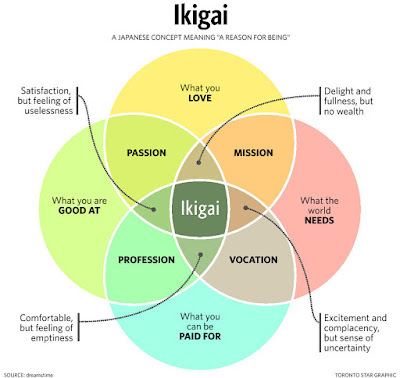 But the picture above struck me as a useful summary of the kinds of trade-offs/hunt for the sweet spot that artists and arts organisations face all the time. How do you find a way to do something that you love, that the world needs, that you’re good at and that you can be paid for? Or reconcile yourself to two or three out of four? No space for details but I think I’ve felt all four of the restricted ‘results’ in my life. the one relating to NICE comes last? The RSA have a new mantra ‘think like a system, act like an entrepreneur’ which I find alternately intriguing, even energising and slightly unnerving. (It’s the entrepreneur word, I think, and its baggage.) This report gives some flesh to this idea – quite complex flesh at times, but it is worth sticking with it if not your preferred style. The application of neither design thinking nor systems thinking is new to the arts strategy, but the combination of them is rarer – and may well be useful for addressing timeworn issues. For many people in the arts Governance falls into the same category of thing as exercise, muesli, training courses, observing speed limits, and flossing your teeth. We know it’s important, and we know we need to do it, and we do, but it’s dutiful hard work a lot of the time. Achieving good governance is a bit like a New Year’s resolution: we know what we’re supposedto say… I joke slightly, but only slightly: and in my experience achieving good governance is a truly difficult task. This report, and the allied practical guide also published by Clore recently sets out an argument for building on strengths – and groans aside there are some – and making sure that, as the report puts it, ‘The creative abilities for which the sector is known need to be given a much sharper focus within the boardrooms of cultural institutions.’ Central to promoting good practice and more resilient behaviour is a suggested new Governance Alliance of funders to encourage strong governance in turbulent times. It would also be good to see all funders publically walking the walk themselves. organisations working in different versions of civic space. It identified some barriers, such as exhausted leaders (my word! ), skills gaps, lack of diversity and confused, unshared, language. (Of which ‘civic’ may be an example. In fact there were times throughout I thought it was making slightly heavy weather of a more exciting subject.) The report suggests some metaphors for the civic role that I find a bit too ‘municipal-civic’. I see some of my favourite arts spaces as more analogous to the bus-stop, the pub, the gym and the shops, than a college, town hall or temple. Why no scruffy or retail spaces, for example? Surely not because many arts leaders don’t go shopping for an afternoon out or to their local bog-standard pub or didn’t hang around bus-stops as teenagers? That quibble aside, it is an interesting and positive contribution, and will be important to understand as it progress. Another personal blog that really struck a note with me and many others was this by Stella Duffy. What can look like one kind of ‘privilege’ or another is often someone holding it together feeling like an imposter about to get caught out. Brings together a lot of evidence: conclusion: digital only useful if it helps you do what you do, but better, but arts organisations need to broaden their horizons to benefit from others’ experiences as audiences’ expectations are changing rapidly. A useful compendium of 18 approaches to evaluation from the Creative People & Places Programmes. 13. ARE THE CREATIVE INDUSTRIES MERITOCRATIC? Short answer: no, but recent research by the authors Dave O’Brien et al suggests ithe leaders in the creative industries are more convinced of this that anyone else. Go figure…. Not a Thinking Practice archive bonus as such, unless something from July counts, but I’ll end on this article I co-wrote with Sue Hoyle of Clore Leadership Programme, after we both spoke and facilitated at a conference for Northern Music Education Hubs organised by Creative Minds and the other Bridge organisations in the North of England. We compare and bring together two frameworks for resilient leadership. This entry was posted in Blog, Uncategorized and tagged arts, civic role, creative industries, digital, governance, resilience, systems. Bookmark the permalink.